Best fencing for dogs – what are the options? When is comes to fencing for dogs it really depends on several important points. A big dog will need a big fence. A four foot fence is nothing to a big dog. Equally small dogs are excellent climbers. It is important to consider the dog breed when choosing a fence. Below are some points to consider when finding the best solution for your dog and environment. All dogs are different, your dog may be fine in your present home and then you move and something changes. Ask yourself the following before choosing your dog fencing solution. Do you live in an urban area? What fencing do you currently have? What breed of dog do you have? Is the dog currently escaping? What size area requires fencing? Below we have noted some of the most popular forms of fencing for dogs so that Fido stays safe at home where he should be! Arguably this is not the prettiest type of fencing but it is one of the most economical. Chain link fencing can be built to varying heights and can also be used to construct a dog run or pen. The issue that people often have with chain link fencing is that other larger wild animals (foxes and badgers) can cause damage to this type of fence. When the fence is damaged this gives the dog an open avenue to the outside worldwide. Interestingly Terriers are particularly good climbers and often see chain link fences as an easy ladder to escape. the lovely links make great foot holds for both large and small dogs. Chain link fences tend to be a popular choice for more rural customers as they can be softened with foliage. If you have a large breed of dog the fence height should be a minimum of 6ft to prevent a “climb out”. This is probably the most popular type of fencing for urban areas. A Close Board fence can be a good option because the dog cannot see the rabbits and squirrels living on the other-side! This may curtail his desire to wander but in some cases can increase anxiety. If a dog can hear but not see what is the other side of the fence this may increase his territorial behavior and lead to excessive barking. When it comes to fencing it’s a mid priced option if you have a small town garden. This type of fencing for dogs is usually sufficient but if your dog is a digger or a climber then this may not be the best solution. A 6ft close board fence is usually only installed in the rear of the garden so you may have to look at other options for the front of the property. Take note if your dog is a digger you should also concrete below ground! Stocking and Deer fencing is usually only installed on large rural properties. 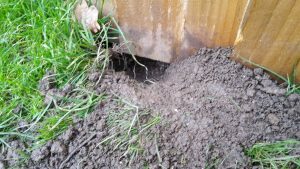 When installing this type of fencing it is usually best to get the fence dug into the ground to prevent the dog and wildlife digging under it. This can be a costly exercise for large areas and depending on the breed may need to be quite high to prevent a “climb out”. Stock fences can be installed in front of hedges to give a secondary barrier. If you have a very small dog then a stock fence will be ineffective as the dog can squeeze through the wire. Incredibly, this type of fencing for dogs has been around for over 40 years. It is a little known fencing solution for dog owners in the UK but widely used in the USA. The advantage of an electronic dog fence is that it can be used on both large or small properties. The electronic dog fence is invisible and so does not create any unsightly barriers. There are several advantages that electronic fencing has over traditional methods. The dog cannot dig under or jumper over the electronic dog fence. It is cheaper than traditional fences. Does not obstruct views and is not unsightly. Can be taken with you if you move. Protects the drive even if the gate is open. Even on most standard urban gardens and electronic dog fence is a most cost effective solution. It is simple to install and offers a safe and effective solution. Having been rigorously tested by Lincoln University these fences are have been proved safe and effective. If you are intrigued but think how our fence may not work for you why not read some of our customer testimonials. If you would like to know more our experienced professionals can chat to you. We can then put together a bespoke estimate for your dog, property and budget. Dog Fencing Ideas – how to keep Fido home! Dogs will be dogs so exploring different dog fencing ideas is a must for any canine owner. Having spent 17 years fencing dogs we have come across many different ideas. As with people no two dogs are the same and of course they all live in different locations. Many rural locations are difficult to fence. Understandably this could be because of the terrain being very hilly, wooded or prohibitively large. Furthermore most rural properties are surrounded by hedgerows. Hedgerows may be a deterrent for a dog with a low prey drive but for many it’s an open avenue of escape. Stock fencing is a traditional dog fencing idea for rural properties. Used to contain livestock it is adaptable for use in rural gardens. For many dogs this will give enough of barrier to prevent the dog jumping out of the property. The downside is that this type of fencing is it is costly, unsightly and can be damaged by wildlife. Badgers and foxes will often make holes in this type of fencing and thus some rural owners find this dog fencing idea a temporary fix. Also the cost of such fencing can work out extremely expensive; starting around £6.00 p/m + gates etc it can a costly exercise. Deer Fencing; again another great rural solution but sadly it is extremely obtrusive more expensive than stock fencing. Again, the downside with this fencing is that badgers and small mammals will make holes that then become an escape avenue for your dog! Electronic dog fencing; you may not be familiar with this product even though this type of dog fencing idea has been around for over 40 years. Using a boundary wire, transmitter and a computer collar worn by the pet this type of fencing can be used on any terrain. Electronic dog fences do need to be professionally installed. This is because the pets need training but they a more cost effective solution than traditional methods. As a guide price an rural installation of approx 2 acres for 2 dogs would be circa £1300.00. The advantage of this type of dog fencing idea is that it can be used cost effectively on very large properties (up to 350 acres) and can be removed if the owner moves house. It is also invisible so will not affect any planning restrictions or spoil the view! Kennels and dog runs are full proof method for dog containment. The downside of installing a run is that many dogs become bored and exercise is limited. The cost of installing Kennels can be high but equally these can be relocated to a new property. Most urban gardens are fenced in some way but these may not all be dog proof! Some new sites have planning restrictions on fence heights and even open plan. Many properties use Picket or Rail type fencing which dogs can easily jump over or squeeze through. Planning permission is not usually required in urban areas. Fences must be no more than 2m high or 1m high near roads. The most popular type of fencing is for urban houses is Close Board fencing. Close board fencing is a great dog fencing idea for many urban owners. It is generally tall enough to stop jumping dogs and quick to install. This type of fencing comes in varying heights and can be installed by most handymen. The downside is that some dogs will dig under and there may be restrictions to installing this type of fencing on some new estates. As a rough cost to install on a small rear garden it would be approx £1200.00. Electronic dog fencing – no need to install gates! As with the rural properties this type of fencing is a very cost effective solution. This type of dog fencing idea also gives the owner the possibility of protecting the drive within the price. It is true that the larger the property for more cost effective the electronic dog fence becomes but small properties can also be fenced with this product. Many owners may already have a Close Board or Picket fence installed and need additional backup. The electronic dog fence can be run around the existing fence if the traditional method is not working. Our Installers can place the cable to prevent the dog jumping over or digging under the existing fence. The cable can even be run under the drive to protect this area. Most owners are concerned that this means digging up the drive but the installation is both neat and discreet. A typical urban property would cost less £1000 to fence and this would include a driveway loop. Interestingly cat runs can be used to keep both dogs and cats safe. These type of structures can prove expensive if they are professionally installed and may not be aesthetically pleasing. 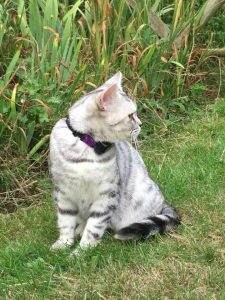 A cat run suitable for a dog would usually cost from £750.00 upwards depending on the size. Old Fireplaces in the hedge! Old garage doors down one boundary! Orange builders netting – not attractive or effective! Electric horse fencing – Harsh and not fall proof! Electronic dog fence – How to train your dog. Ensure that you have the correct amount of training flags to cover the boundary. The training flags are the most important part of the training protocol for electronic dog fences. The training flags should be placed approx 8 – 10ft apart around the boundary. Use the collar to find the edge of the avoidance zone and place the flag in the ground in the area where the collar starts to beep. Using the dog fence tester – set the collar to beep only mode. This means that the collar will not give out an impulse just an audible tone. Place the electronic dog fence collar on the dog and check that it correctly adjusted. As a guide you should be able to get 2 fingers in the neck strap when the dog’s neck is down. See our Trouble Shooting page for handy tips. Leave the collar on the dog for at least 30 mins before commencing the initial training session. Find a long lead – 6ft and ideally not the dog’s usual walking lead. Take the dog outside on the lead. Walk the dog around the boundary and tap the flag so that there is good movement. As you tap each flag use a command word – a good example is “Watch out”. 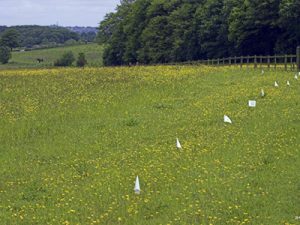 Allow the dog to go past the training flags into the correction zone (this is the area of the electronic dog fence where the collar will give both a beep and impulse). Allow the dog to linger here and hear the warning beep then direct him back into the garden. Use the command word and tap the flag again. Repeat this around the boundary for several small sessions over 1 – 2 days. Place the electronic dog fence collar on the dog approx 20 – 30 mins before starting the training. Using the tester – lift the level on the receiver from level 0 (beep only) to level 1. Repeat the process of walking around the boundary and tapping the flags. Always use the command word when tapping the flag. Allow the dog to go past the flags into the avoidance zone. Look for any signs that the dog is feeling the impulse (a small twitch of the ear, little shake of the head). Carry on around the boundary allowing the dog to walk into the avoidance zone of his own free will. Never call or drag the dog into the electronic dog fence zone. If the dog is not responding to the level – lift the level to level 2 and repeat the process. Always direct the dog back into the safe area and praise the dog when he is back in the safe zone. Once the dog is reacting to the stimulation make a note of the level. After training play with your dog, praise him and reward him. Do not allow the dog to be off the lead in the garden during the training phase. It is important the dog fully understands the warning beep and how to retreat when he is in a high drive moment. By carrying out the distraction training your dog will learn the electronic dog fence so that it becomes second nature. This will ensure that even when he is in a high drive state he stops at the warning beep. The distraction training will require 2 people. Walk around the boundary, tapping the flags and then have the new person walk into the flags and well into the avoidance area. See if the dog continues or decides to stop. If the dog continues allow him well into the zone to receive the stimulation and guide him back to you in the safe area. Give him the command word whilst guiding him back to the safe area. Praise him in the safe area. If the dog stops before or at the flags guide him back and praise him. Continue walking around the boundary and repeating the process. Once the dog is making the right decision (not walking into the flagged area) move on and try this on the driveways or open areas. If the dog is making good progress you may wish to drop the lead and walk into the flagged area with the companion. If the dog endeavors to follow give the command in aloud and firm voice. A good indication that the dog is fully at home with the electronic dog fence is when he looks away from the flags. Repeat this process over a couple of days. Walk the dog around a couple of areas and tap the flag if possible. Usually by this stage the dog will not venture near the flags so just give the command word even if you are several feet away from the flag. Go to the centre of the property and face the dog away from boundary. Remove the lead and start to walk back towards the house or a safe area. Play with your dog outside – you can roll a ball but always roll away from the avoidance zone. Do not leave the dog unsupervised in the garden for the first few days. After 14 days you can start to remove the flags. Remove the flags every other flag, every other day until they are gone. Keep the flags in a safe place as if you wish to add on another pet you will need to re-flag the boundary and if you change the layout this will need to be re-flagged to give the dog a visual. Training your dog to the electronic dog fence should be fun! Never throw a stick or ball into the avoidance zone. Small bit size sessions are often better. Always remove the dog fence collar at night or for a period of 8 hours in every 24 hour period. Check the fit for your electronic dog fence collar regularly. Check the battery status on your collar monthly (using the tester supplied). DogFence Ltd are the largest installers of electronic dog fences in the UK. Our professional installer/trainers can set up your dog fence for you and will train your pet to the system. We also offer a post installation service to train new pets to the system. If you would like more information please call us on 01628 476475 or email info@dogfence.co.uk. Fencing for dogs – Which Fence Is Best? Here you are finding yourself researching about fencing for dogs. I am guessing your canine companion is one that is a great escape artist! 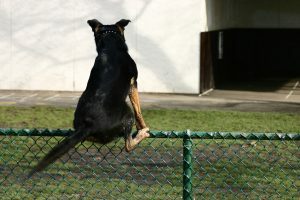 I have one too and not one who jumps over a fence but one who finds the smallest gap and squeezes himself out or it may be you have a high energy dog who just loves attention from any passing people or other dogs, whatever breed you own, a dog is always on the lookout for freedom to roam. Even shot for chasing livestock. Picked up by the local dog warden (which costs you). Be at risk of injury or hit by a moving vehicle. All of these worries are real today! Dogs do not see these dangers, they escape because they can and often if left for long periods of time, because of boredom. A dog can jump over. Dig it’s way out underneath. Chew through in a bid for adventure or someone to be with. People say a dog can run through the wireless type of fencing for dogs – however…read on and you will see why this is and why Dog Fence systems do not pose this issue. There has been much stigma about electronic fences and shock collars but they’ve improved over they years and a fence such as the Dog Fence hidden fences are legal dog fence systems with patented fail safe FM radio frequency technology that does not fail like AM frequency fencing systems. What is an Invisible Dog Fence & How Does It Work? An FM radio signal created virtual fence. Dog Fence uses the Safelink patented FM digital technology. 15 times faster than AM radio signal fence systems. An invisible fence which can cover a large area. The radio signal transmits to a collar worn by the pet. A zone before the boundary triggers a high pitched beep from the collar, to warn your pet. At the boundary, your pet gets a small static shock, through the collar. The pet retreats to a safe area. Maximum protection against false activation. No dog can run out of an FM radio signal. 2-5 days training programme for your pet. Suitable for dogs over 12 weeks and cats over 16 weeks. Discomfort from the shock, experienced by your pet, occurs mainly during the initial training. It feels no worse than an annual vaccination. The shock pain cannot compare to the pain of being hit by a car! Costs a fraction of the price of installing a traditional fence. Wireless dog fences have a few advantages over their wooden or chain-linked counterparts. Many electric dog fences require few tools to install and can be set up in an afternoon. Unlike a traditional gate, the layout of many invisible dog fences isn’t as restricted by the topography of your yard. Using an invisible fence does not obstruct your view, it is ideal for creating a space for your dog. A wireless dog fence allows you to increase the range of your boundary area. You can link additional transponders to increase range of the FM signal. All things considered the best fencing for dogs is an invisible pet fencing solution, one which transmits over FM frequency. After all we are pet lovers and the importance of our pets safety should not be underestimated. Pet shelter organisations do require you to have secure fencing in place before approval of adoption too. With other types of fencing for dogs, a pet has the means to escape. You want peace of mind that the fencing for dogs you choose is secure enough to keep your pet safe. They are highly effective at pet containment. The fence is invisible and does not obstruct your view. A cost effective solution which allows freedom for a safer, happier, independent pet. An easier life for you the pet owner having less worry. Dog Fence offers a pet training programme as part of its installation service. This is designed to minimise the static shocks, to your pet, by ensuring can teach your pet it’s new boundaries. So don’t wait, get in touch with our friendly team here at Dog Fence today for an informal chat about fencing for dogs to suit yours & your pets needs. Electronic dog fences – are they safe for small dogs? Are electronic dog fences safe to use for small dogs? Electronic dog fences have been around for over 40 years. Unsurprisingly in the early years this type of electronic dog fencing was most certainly not suitable for small dogs. Why were they not suitable? Size and weight of the computer collars! Many of the early collars used a 9 volt battery to power the collar which was both bulky and heavy. As with mobile phones recent advances in technology have enabled the size and weight of the computer collars to be dramatically decreased. At DogFence we are proud to be able to offer the smallest and lightest electronic dog fence collars on the market today. Our mini computer collars weigh only 30g including the small 3.0 volt battery. Our electronic dog fence collars are suitable for all breeds of dogs and cats and with the increasing popularity of toy breeds our sales of mini collars has risen significantly in the last 5 years. Small enough for cats too! Will the electronic dog fence hurt my dog? Naturally a common concern is that the “correction” or impulse will hurt the dog. Naturally, at DogFence we are all dog lovers and the last thing we would want to do is inflict pain or suffering onto any dog or cat. The impulse level is set to each dog or cats personality. People often asks does it hurt? can I feel it? In reality, once they feel the impulse the next reaction is usually “how will that keep my dog in?” or “oh it’s not that bad!”. Electronic dog fences have been tested by leading Universities and pet professionals across the world. The results have proved that these fences are safe to use with both dogs and cats. The amount of impulse delivered is not determined by the size of the pet but their personality. The average setting for most dogs is level 2 this would equate to some 250 times lower that a cattle of electric stock fence. Interesting, the impulse is generally only received during the training phase. All our electronic dog fence collars give out a warning beep prior to giving out the impulse. During the training phase the pet also has a visual marker with training flags. If the training is carried out correctly the pet will rarely receive any activation after the initial period. All our DogFence installers are qualified to train your dog or cat to the containment system. DogFence is a member of the IACP an international organisation set up for training dogs using electronic stimulation alongside conventional training protocols. Will I have to use the electronic dog fence forever? This is always a difficult question to answer. It really depends on your dog’s personality and hunting drive. As a rule we find that dogs and cats that are trained before the escaping behavior begins will train quickly and easily and never challenge the fence. However, if you have livestock or game birds nearby and a dog with a high drive then it is advisable to use the system everyday. With electronic dog fencing consistency is king. If every time the dog enters the zone they hear the warning beep they will not “challenge” the fence. Issues can arise if they can go through the zone one day because they are not wearing the electronic dog fence collar and not on another day it becomes confusing to the pet. Recent studies through Lincoln University, headed by the well revered Prof. Daniel Mills, and the Governments research have proved that electronic dog fences are only safe and also save the lives of dogs and cats. With modern technology size is no longer a barrier to pet containment with an electronic dog fence. Read more about what the experts say on our web site. If you would like to learn more about how an electronic dog fence can keep your pet safe contact us on 01628 476475 or email us @ info@dogfence.co.uk. How to stop the dog escaping from the garden? Ways to stop the dog escaping from the garden? A common question that we hear from owners is how can I stop the dog escaping from the garden. Dogs will be dogs, some escape because they have a high prey drive or they are bored, sometimes it’s food driven. When considering dog proofing the garden there numerous options available. An escaping dog is not only dangerous but can be very stressful. Radio dog fences have been available for over 40 years but many people still do not know that they exist. They are often referred to as invisible fences or a freedom fence. A radio dog fence is usually a much cheaper method to help prevent the dog escaping from the garden. The fence is more like a virtual fence – there is nothing to see and the fence can cover large areas or areas that would not easily be fenced by a traditional fence. A radio fence is a simple solution to stop the dog escaping and in monetary terms an inexpensive solution. So what is a radio dog fence. In simple terms it is just a radio transmitter, a boundary wire that surrounds the boundary or the area to be “fenced” and an innovative computer collar which is worn by the pet. The transmitter sends a coded signal through the boundary wire and a “no go zone” is set when the pet enters the no go zone the computer collar activates and lets out a high pitched warning beep to alert the pet that they are in the wrong area. If the pet continues further info the zone the collar then gives out a small static shock (correction) which is set to the pets personality. With the assistance of some temporary training flags and training from the fence installer the pet quickly learns where the boundary is. The great advantage of radio dog fence is that is covers all areas including the driveway so if someone leaves the gate open the pet cannot wander in the road. Also the radio signal is 360 degrees around the cable so dog or cat cannot climb over or dig under the signal. With the DogFence system the signal is also quicker than any other pet fence worldwide so that dog or cat cannot out run the fence. Electric fencing or electric stock fencing can be used for pet containment but it is not advisable and the shock given out by an electric dog fence is 250 times higher than the output on a radio dog fence. Also with an electric fence if the pet gets stuck in the fence they will continue to be shocked until the fence stops or they are rescued but with a radio dog fence the fence shuts down after 15 seconds to ensure the pet is not over corrected. Of course an electric fence is not only more expensive but cannot cover gateways or driveways and if there are children or members of the public close by they are also affected by the electric fence. Dog runs are a great solution for keeping your dog within a confined area of the garden but these can be very costly and unsightly and of course will only give the dog a limited area to use. It is also advisable to install a dog kennel within the run so that dog has somewhere to go to if it is very hot or rainy. In some areas planning restrictions may apply and it is always advisable to check with our local council. Other Solutions to stop the dog escaping maybe to try to train the dog to stay in the garden, for some breeds this maybe a workable solution but for those with a high prey drive or who have had a previous history of constantly escaping the drive to leave the property may be too great. Here at DogFence Ltd we meet customers with different breeds and personalities but they all have one thing in common! they want a solution to the stop the dog escaping. Many have tried other forms of fencing and many are sceptical as to whether a radio dog fence will work. Our customers are our best advertisement (Customer Testimonials). If you would like to learn more about our radio dog fences please call us on 03450 623623 or visit our web site www.dogfence.co.uk.